Our Customers Had A Lot To Say About Our Services! Reliable, courteous, patient with the client, helpful and affordable. The equipment (vans) are in good condition and the owner is very careful to make certain every aspect of the transportation is as safe as it can be. Very friendly and caring transport company. Went the extra mile for my mom’s transport. Highly recommend. I had a fabulous customer experience with Medbridge! They arrived early for the appointment and were provided a high level of professionalism from the beginning to end of our interaction. I would highly recommend them. Absolutely the best. The care and attention he gives to my Mother is exceptional. David goes above and beyond. He is also one of the nicest people you would ever want to meet. I am very happy with the service I have received from Medbridge Transport. Their concern for the safety and comfort of my mother was very reassuring. I highly recommend them. I have used other transport services and no other compares. Dave was very courteous and let my wife know what he was doing every step of the way ans was a very safe driver. I will be using Medbridge for all my transport needs in the future. I called them to drive my husband home in the wheelchair van after his stay in a rehab facility. David was right on time and very caring and efficient delivering my precious "cargo" back to our home. I would definitely call him again if we need this kind of service. An outstanding service - punctual, safe, and courteous. I highly recommend it. Good service, polite and timely. Vehicle very clean and customer friendly driver. Professional and Great Customer Service! They were awesome. I have already recommended them to several friends. After having transportation company show up late or cancel at the last minute, Medbridge was much appreciated!!! I cannot Thank Debra and David enough for helping me out of a very bad situation. I called Debra holding back my tears to explain United cab was a No Show for my elderly mother's very important doctors appointment. Debra quickly called David and David quickly called me. He told me he could help me out and he would be at my house in 30 minutes. David arrived 25 minutes later with a smile on his face. Truly Amazing! David was very friendly and professional. He took care of my mother as if she was his mother. David told me his wife says he drives like a old man and this is true. My mother loved it. We arrived at 1:10 for a 1:15 appointment. Truly Amazing! When the appointment was over, David was outside waiting. Medbridge Transportation has a customer Forever.. Thank You So Much! I wasn’t able to use my arm to get into a car due to a broken collarbone, so I called Medbridge transport. They have great prices and the owner David is very dependable and caring. This was my first time to be transported to a doctor in a wheelchair and I was very impressed. I highly recommend them! 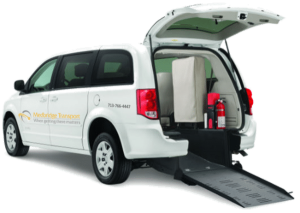 If you or your loved one is able to walk with support, sit upright for the duration of the ride, and transfer safely in and out of a passenger vehicle (with or without support), then our ambulatory medical transportation fleet is the right choice for you.